If you’re familiar with the Cover Flow feature in iTunes, you’re already familiar with the Finder’s Cover Flow view in OS X El Capitan. To display a window in Cover Flow view, click the Cover Flow view button on the toolbar (shown here), choose View→As Cover Flow from the Finder’s menu bar, or press Command+4. This figure shows Cover Flow view. A window in Cover Flow mode. 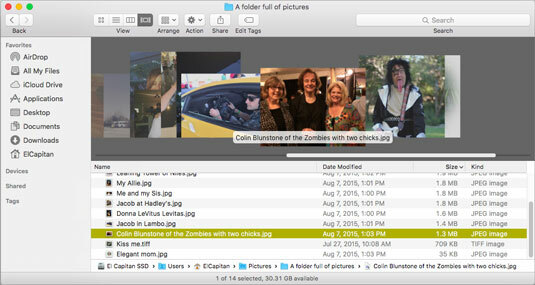 The item selected in the list (Zombies lead singer Colin Blunstone with fans) appears in a preview in the top part of the window. You can flip through the previews by clicking the images to the left or right of the current preview image or by sliding the scroll bar (above the Date Modified, Size, and Kind columns) to the left or right.